Three days in NYC and no time for ice cream...a pure disgrace. After cruising by so many cool spots in the village to grab a scoop I ended up sniffing out a last resort creamery in Grand Central Station. 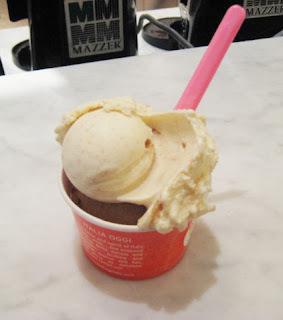 And for my last chance at a scoop before heading home I sure stumbled upon a good one, the Ciao Bella Gelato Company. Wow, was I pleasantly surprised! I can't say I've tried gelato too many times so this was a sweet treat. It was a hot and humid day in the city and I craved something refreshing so my choice of the day....Key Lime with Graham Cracker Swirl Gelato. This generous scoop was white in color, offered a sensational creamy texture with the perfect key lime tartness and graham cracker swirls throughout. This was SO good and the perfect flavor for a hot summer day. Ahhh, refrshing! Bella was recently named one of the top brands on the verge by BRANDWEEK and is quickly becoming one of the nation’s most watched frozen desserts. 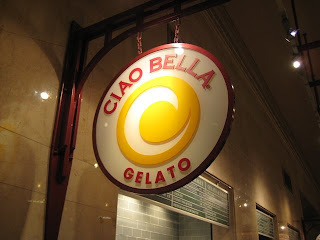 Ciao Bella has been named best gelato and best sorbetto by Real Simple Magazine. Oh man do I love Ciao Bella! Especially the pumpkin flavor offered during the holidays. I also love the random 'Chef's Selection' flavors they offer. You never know what goodness you'll get. That flavor sounds so delicious!